At Trinity Gardens School we have a dedicated team of leaders working collaboratively to ensure your child is receiving the best education. We bring together the learning to ultimately improve students’ outcomes in all areas of learning. As a Leadership team, we manage the school resources and support staff in their development as professionals. We align resources to site and departmental priorities, inclusive of teacher development, student support and intervention programs. As leaders we attend across partnership meetings and departmental functions, including a Literacy Summit and Leader’s Day being held this week. Such conferences support our ability to identify, support and track students excelling or requiring support within learning areas. Staff are regularly supported to build their capacity, accessing professional development which occurs within and outside the school, often accessed on weekends and during school breaks. This year staff have already accessed workshops to support students with Autism and Sensory needs. Future workshops include an Early Years STEM and Maths conference. Throughout this term we will be highlighting other leaders within the school in future newsletters. In the meantime, feel free to chat with our leadership for more information. 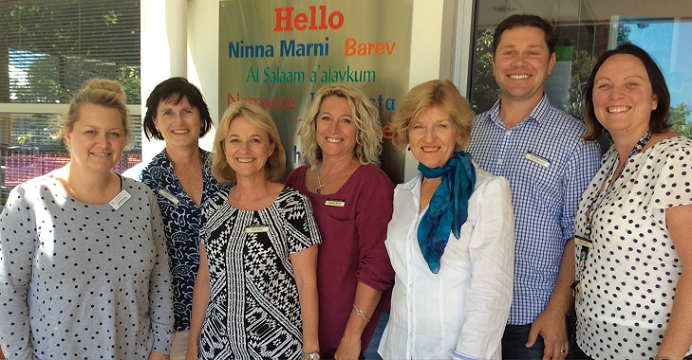 Above from left; Catherine Day - Director Children’s Centre; Marg Erwin - Principal, Tonia Doody - Deputy Principal; Liz Mullins - Coordinator St Morris Unit; Catherine Banner - Coordinator Steiner Education; Scott Blakemore - Senior Leader Curriculum and School Operations and Nat Carling - Senior Leader Student Engagement and Well-Being.